Writing a novel: LAUNCH DAY! Eek! Today is the day of the UK launch. So just how am I feeling today? Excited? Elated? Elevated? Well, if I had to choose another eor two, I’d probably settle upon exhausted and ecstatic all rolled into one great big eek! So what’s to do? Champagne flutes to deliver to the Arts Centre in Stamford, pack the amp for the mood music – oh and create the playlist for it – remember to bring tea towels, table cloths and J-cloths, don’t forget to collect the guest of honour from the train station, confirm the numbers – and it would probably be a great idea to pack copies of The Thinking Tank as well. Sounds glamorous? Does it heck! Do I care? Not a jot! It’s certainly not about glamour – although I do confess I have bought a new dress – but then I don’t need a book launch to find an excuse for that. And to be fair, when we launch next week in Holland, there will be little more for me to do than turn up and smile (might we possibly need another new dress – something elegant with a continental twist?). So what is today all about? In so many ways it’s all about people. People you want to thank for supporting you all the way. People who have put up with endless hours of abandonment in deference to the book, and people who have advised and just been there – the cheerleaders who never allowed you to relinquish the dream. And of course, it’s all about sales. Like a Private View at a gallery, you are hoping against hope that people will like what you have created enough to buy a copy of your work, and of course it doesn’t stop there. You are out there then. Naked. On show. And people are reading your work – commenting, judging, liking, disliking, recommending – or not. So more than anything, this is about hope. So I hope, and hope that my work will not disappoint; that there will be something within its pages that will speak to you, resonate and at least make you think. After all, wouldn’t that be why you’d buy yourself a Thinking Tank? We decided to abandon ship for 24 hours this weekend and head for an internet-free zone – to the extent that, stopping at a cafe, I had barely crossed the threshold when a squeak came out of my mouth; Do you have internet? The waitress looked down and shook her head – sorry, no…we can’t get a signal. Fantastic, I said, beaming at the puzzled girl as we settled ourselves and the two chihuahuas comfortably by a rack of out-of-date magazines and the local paper. That was just the right answer. But the weirdest thing that happened was en route for home. The traffic lights had turned to red and we stopped outside a bookshop. Scanning the shop window, I did a double, triple, then multi-take as I realised that a familiar cover was peering back at me, omplete with its bougainvillea, sunset and pretty lady staring out to sea, blazing its title, The Thinking Tank for all to see. This was it. I was looking at my own book, which was looking back at me. Now, I know I shouldn’t have been surprised since I was the one who had supplied the books to this particular chain. But it still just seemed surreal and I somehow had not expected it to be thrust boldly into view. This is amazing. Just amazing. I am so grateful to the universe and to everyone who supported me on the journey to being published. I am so stunned and so excited at seeing my book not only in print but in print, in a shop window, in a shop that I have long respected and in which I have spent many, happy browsing-hours and hopefully will do again – probably on 7th October when I install myself in Walkers Books, Bourne in the hope that that some lovely customers will want a signed copy of my book. So why did we want to escape the net? 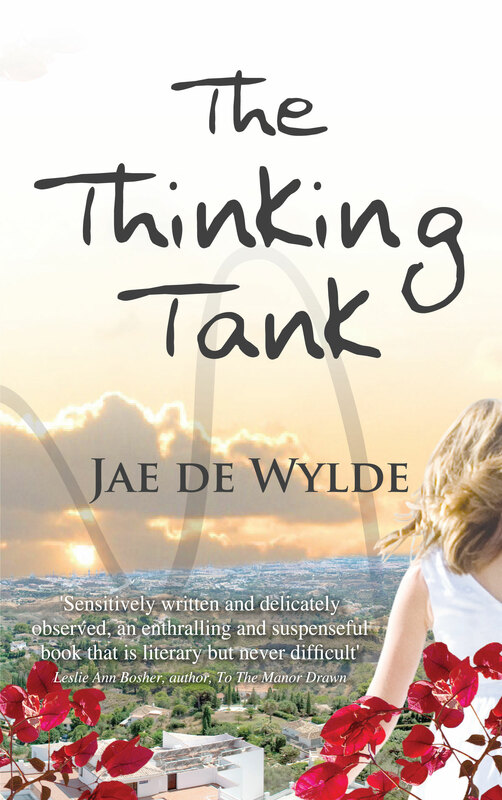 The irony of having written a novel called The Thinking Tank is that since completing the process I have barely had a minute to think. Somehow with the internet beckoning us at all times of the night and day, our quiet spaces disappear and for me, the joy of a careless flick through a magazine, the pleasure of allowing the mind to wander off and smell the roses in some distant place, the space to allow another story to sift itself into a proper plot with real, vivid and honest characters, all of that is lost in the constant need to feed this or that social site, to answer this or that quirky question, to be active, to market, to present and not just to be. But somehow seeing The Thinking Tank in that lovely shop window has been a reminder that this is what I have to do. Like it or not, the net has been my very best friend through the whole process – from writing through to finding a publisher, from editing through to cover design, so I can be out there, on the market, in the high street so people can find me, to buy me, to read me, to make everything make sense. The errant eagle has finally landed. The Thinking Tank is a real, live, all-singing, all- dancing paperback book. Weeks of nail-biting madness while we sorted out the paper glitch (see previous post) and then the delivery hitch (ditto) – but even then I managed to be out when my books arrived. Thank you, dear neighbour, for running after the UPS delivery man and rescuing my booty – but even that final leg of the beginning of my life as a published author was not without its drama (Note to reader – I have already confessed to the Drama Queen badge so no surprises here.) . Got home, saw the note through my door, rushed across to next door, hammered excitedly and smiled expectantly. Ten minutes later and the key to the neighbour’s garage is still missing and the strain of me watching her every move, willing her to find the lost keeper of my treasure, gets too much. She sends me away, promising to pop round when sesame can be opened. Do you know, I decided there and then that this was just not going to happen. Not now, not ever. The universe had somehow decreed that after all the angsty, spleeny, crappy mess, I was to be separated from my heart’s desire by a measly, metal up-and-over door. The big, fat kiss I landed on my neighbours pink cheek when finally she did appear, staggering under the weight of two heavy boxes, definitely took her by surprise, as did the speed at which I administered her thank-you cup of coffee and sent her on her way. I tore the boxes open and held my brand spanking new novel aloft. Well – 160 of them actually. If this process has taught me anything, it’s to take nothing for granted, and I wanted to make sure that every single Thinking Tank was a Thinking Tank and not some random copy of Fat at Fifty or Compost Now for Curvaceous Cucumbers. There they all were – a sea of bougainvillea creeping around each of their perfectly formed covers with their perfect, pingy, creamy-papered interiors. My book. At last. In my hall. At home. Oh my God! One great big blooming phew! 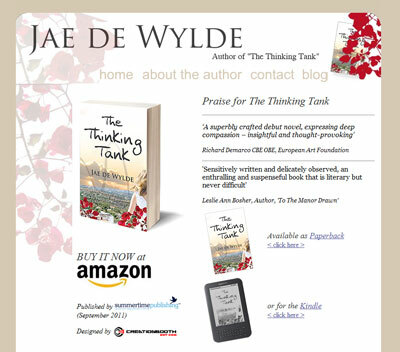 Now if you could all just be darlings and give The Thinking Tank a try, all would be exceedingly well! Writing a novel: Is today the day? Today is the day that my real, live novel should arrive, complete with its pingy, creamy coloured pages and its lovely Think Tanky cover. I have stuck a notice on my gate so that the delivery man knows that if he leaves a card and goes off without leaving my precious package, he will do so at his peril. Have you ever noticed how you get really excited by something and then when it doesn’t happen when you expect it to, that kind of childlike anticipation and joyful prospect is gone? Like when you are supposed to exchange contracts on a house and you get a time and date. And then it doesn’t happen. You get another time and date. It doesn’t happen. You get another time and date. It doesn’t happen. Yawn… And then you start building reasons why you don’t want to move anyway – just in case it never happens. Or when you are expecting exam results? The whole moment is somehow marred by the extra wait time – like if you wait too long to eat you find your appetite has fled. You just lose that all-important impetus. I guess that’s how I have been feeling. It seems like my whole life has been building up to this one moment when my first-published novel is in my hands. That’s not true, of course since a) I never truly expected to have a novel published and b) There have been some amazing blessings as well as sadnesses in my life so this one moment shouldn’t be allowed a disproportionate sense of importance. But what the heck? That’s the way it feels. Writing a novel: Ready, Steady. LET GO! I am a control freak. There – I’ve said it. Time to own up because I simply cannot hide it any longer. And if you are just going haha I knew that all along then please keep it to youself since I thought I was doing a great cover up job and don’t wish to be disillusioned at this point. Or any other point. Ever. Fellow control freaks out there – and you know who you are because we know who you are – listen carefully. I am saying this very, very slowly and very, very loudly: Having your work published means you have to let it go. Yep – that’s just what I said. LET IT GO. Letting your novel go is like being the empty nester who has nurtured six offspring and the final one has just moved out. It’s painful and scary (here we go – scaredy cat showing its claws yet again) but worse than that, if you don’t let go then people might just get mad with you. Your agent is just that – an agent, which means they are meant to do stuff for you. And your publisher is what it says on the can. This means that once you have completed, checked and double checked your manuscript and sent it off into the ether and a designer has done his or her stuff and you (if you are as lucky as I have been) have gone yay to the cover, it is firmly and finally out of your hands. And this means you have NO control. You are not supposed to have any because the agent and publisher are now doing their jobs, which they don’t appreciate you trying to do for them. And yes, I know this from experience because I am a control freak and getting this wrong goes with the highly controlled territory. I simply cannot help myself trying to steer the ship. Except I have no chart – just little blurry islands dotted around the ocean of the publishing world with no means of making them join up. So, before all agents and publishers issue an ‘I am not a control freak swear-on-a-religious-book declaration’, which we have to sign in blood before a literary expert considers our work, we freakers need to practise softening off our iron grip, donning a velvet glove and letting go. In the same way that we cannot control what people say about our work, we cannot control the way in which the experts work with our work. Fine words, great concept but can I practise what I preach? Velvet glove, my arse. So far today has been a very good day. The lovely, pingy paper is crisping itself up to become the creamy coloured pages of The Thinking Tank, I have finished a batch of freelance stuff and my alma mater, the University of Bristol has added me and my book to their lovely website pages, featuring alumni authors: http://www.bris.ac.uk/alumni/featured/books/ . Plus I have been invited to another bookshop for signings. One huge, fat yay! My moanings and groanings last week are sufficient testimony to the bad days. And of course they have been a lot worse. But this time I am going to try an experiment and savour the moment. Hang on. Right. OK. That’s how I feel just now. The idea is that if I get in touch with the here and now and stop fretting about the what ifs and whens, the next time I am near exploding point – or bleating and whining point, which I feel sure is much worse – I can take a very deep breath and place myself back in the moment that was good. Like switching the TV channel or turning the page of a magazine. In other words, I can work at choosing how I feel and rejecting the negative by digging deep and dragging the positive from wherever it lurks. This sounds very new agey I know. Probably is. But whenever I am writing – and I was working on my new novel last night – it’s exactly what I find myself doing to get under my character’s skin. It’s like stepping out of yourself so you can experience the character’s thoughts and feelings, allowing your character to own them. And if you can do that for your character, then why not try it for yourself on one of life’s crappy days? Maybe, in the same way we can help shape our characters’ lives, we can work on shaping our own – refusing to be drowned in negativity. How many times have we only heard the bad comments when someone offers their thoughts on our work? I resolve here and now to focus purely on the good; digest the bad, take from it what is useful but stay in the moments that are positive. Until my husband watches three hours of football on the telly, that is! 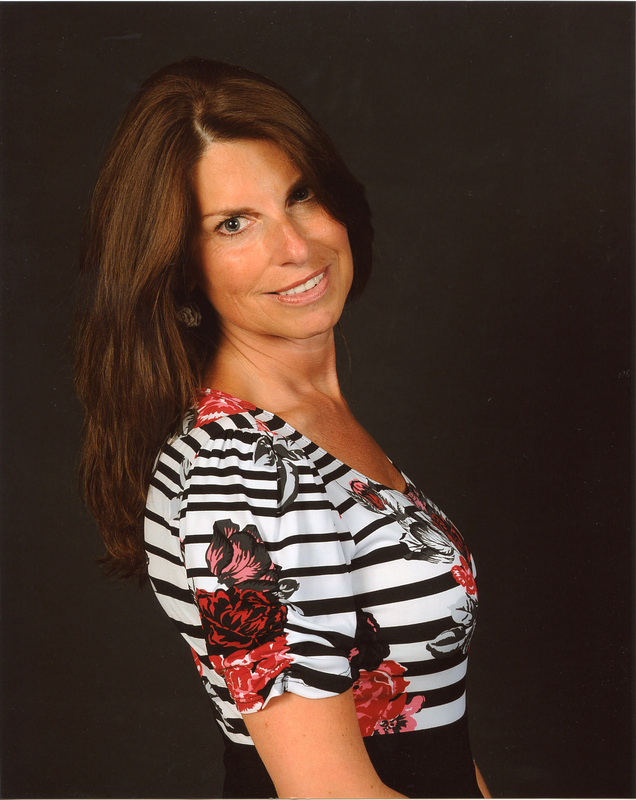 Writing a novel: Shameless Self-promotion…do we really have to? It’s a few days since my paper drama, and given that I promised to write about writing a novel from publication back to concept, we should already be some where in the past. But nope – ‘fraid not, because until I have the revised version (not the bible – The Thinking Tank) in my sweaty betty palm, I am not moving off the spot in terms of timescale. So we are stuck here for a bit, at least. SO we are back to the future, which apparently involves a lot of shameless self-promotion. That particular turn of phrase is not mine. I have ‘borrowed’ it from Jo Parfitt (www.joparfit.com) and if you are in the market of mass marketing you should check out her website as she posted a great feature on the whole self-promotion thing a couple of days ago. It’s all about doing a virtual book tour with a kind of karmic flavour where you interview someone and then someone interviews you so it all beocmes a kind of interview fest and the one who gets it out there most goes to heaven with their film rights being sold. Great theory (actually I made the film rights bit up, but isn’t it whst we all dream of?) – which is a fab idea…BUT. If you have no followers (sobs into cereal) then who can you offer to help in order to get your karmic returns? Problema, n’est-ce pas (note the injection of a multi-lingual quip)? Something else happened that underscores for me the need for the whole promotional jazz these days – not least the fact that everyone else is at it, of course – and so you start way behind the starting line however ludly you can shout No, the other thing that happened was actually quite shameful. I am giving a 2-hour dance workshop at the weekend (www.guildhallartscentre.com) and have advertised it as always by email – and thought I was doing pretty well on the publicity front. I just met a lady in my village who is a strong supporter of my shimmy and shake classes and she enquired as to when the next class would take place. Guess what? She’s not on email. Why, she asked, hadn’t I just put up a poster in the post office window? Why indeedy? And she was really disappointed as she has a commitment that time that she cannot break.